Ultrasonography is a popular imaging modality in the initial evaluation of abdominal trauma. While it provides a quick, noninvasive, low-cost means of detect ing peritoneal fluid collections, without exposure to radiation or contrast agents (Brown et al. 1997), the role of ultrasound in the radiographic evaluation of renal trauma has been widely questioned. Its limitations stem from the difficulty in obtaining good acoustic windows on the trauma patient who has sustained numerous associated injuries. The results are also highly dependent on the operator. Ultrasound scans can detect renal lacerations but cannot definitely assess their depth and extent and do not provide functional information about renal excretion or urine leakage. By using color Doppler, power Doppler, or ultrasound with contrast, one can usually establish the presence of blood flow to the kidney. Gray-scale techniques can determine if the kidney is intact. However, ultrasound cannot establish if renal function is present, and there is also difficulty in some cases of differentiating a shattered kidney from a congenitally absent kidney. Since adynamic ileus is often present, it can be difficult to precisely determine if the renal contour is intact (Goldman and Sandler 2004). In contrast-enhanced ultrasound, the kidneys should be covered adequately in the supine and the contralateral decubitus position. The kidney to be examined is scanned and documented longitudinally and transversely. Depending on patient size, a bolus injection of 0.3-1.2 ml of second-generation microbubbles is administered. The renal cortex enhances rapidly and densely, followed by the pyramids, so that the entire renal parenchyma is enhanced within approximately 40 - 50 s. There is a rapid wash-through of contrast in the kidneys, but there is adequate contrast accumulation for about 2 min, allowing reliable scanning for anechoic defects (Thoreli-us 2004) (Fig. 15.4.7). Despite the drawbacks of the method, ultrasound scans can be conveniently used during the primary assessment of renal injuries (Qin and Wang 2002). During the evaluation of blunt trauma patients, ultrasound scans were more sensitive and specific than standard intravenous pyelography (IVP) in minor renal trauma (Arena 1997). In another study comparing the results of ultrasound scans and IVP, the sensitivity of ultrasound decreased as the severity of the trauma increased, while that of IVP remained high for all degrees of severity (Lopez Cubillana et al. 1998). Another possible role for ultrasound may be for serially evaluating stable renal injuries for the resolution of urinomas and retroperitoneal hematomas (Pollack and Wein 1989). Ultrasound is considered an effective screening examination that can obviate more hazardous tests such as CT, cystography, and peritoneal lavage in most pregnant patients with trauma requiring obj ec-tive evaluation of the abdomen (Brown et al. 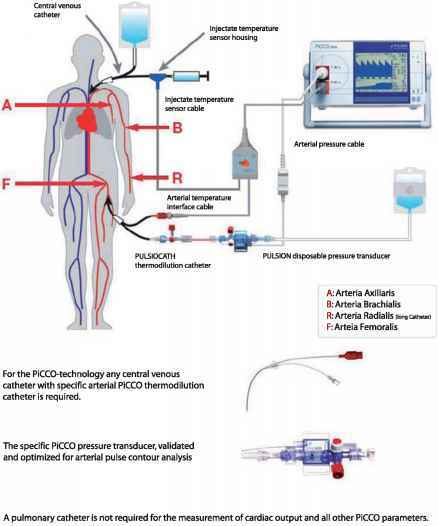 2005) and suitable for the routine follow-up of renal parenchymal lesions or hematoma in the intensive care unit. In conclusion, since ultrasound scans are used in the triage of patients with blunt abdominal trauma, they can be helpful in identifying which patients require a more aggressive radiological exploration to obtain a diagnosis of certainty (Buchberger et al. 1993; McGahan and Richards 1999; Rosales et al. 1992). Ultrasound findings do not provide sufficient evidence for a definite answer on the severity of renal injuries. Formal IVP was the preferred imaging study for evaluating renal trauma until its replacement by CT. While standard IVP is no longer the study of choice for the evaluation of renal trauma, we acknowledge that in some centers it maybe the only study available. In these situations, IVP should establish the presence or absence of one or both of the kidneys, clearly define the renal parenchyma, and outline the collecting system. In order to stage renal trauma, the IVP should include nephrotomograms, delineate the renal contour, and visualize the excretion of contrast material from both kidneys into the renal pelvis and ureter. Nonvisualizati-on, contour deformity, or extravasation of contrast implies a major renal injury and should prompt further radiological evaluation with CT or less commonly, an-giography if available. The most significant findings on IVP are nonfuncti-on and extravasation. Nonfunction is usually a sign of extensive trauma to the kidney, pedicle injury (vascular avulsion or thrombosis), or a severely shattered kidney. Extravasation of the contrast medium also implies a severe degree of trauma, involving the capsule, parenchyma, and collecting system. 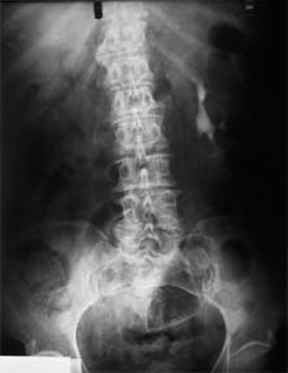 Other less reliable signs are delayed excretion, incomplete filling, calyceal distor tion and obscuring of the renal shadow. The sensitivity of IVP is high (> 92 %) for all degrees of trauma severity (Lopez Cubillana et al. 1998). Unstable patients selected for immediate operative intervention (and thus unable to have a CT scan) should undergo one-shot IVP in the operating suite. The technique consists of a bolus intravenous injection of 2 ml/ kg radiographic contrast followed by a single plain film taken after 10 min. The study is safe, efficient, and of high quality in the majority of cases. It provides important information for decision making in the critical time of urgent laparotomy, concerning the injured kidney, as well as the presence of a normal functioning kidney on the contralateral side (Morey et al. 1999) (Fig. 15.4.8). a flank wound or gross hematuria following penetrating trauma (Nagy et al. 1997). 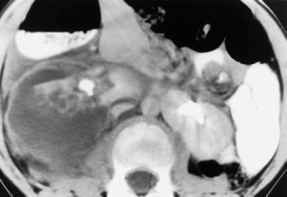 Computed tomography is the gold standard method for the radiographic assessment of stable patients with renal trauma, though it may not be available in all settings, and is time-consuming. The higher cost of CT scans is a also major disadvantage, but CT is more sensitive and specific than IVP, ultrasonography, or angi-ography (Bretan et al. 1986). In a retrospective study, Qin et al. found that the positive rate during evaluation of 298 patients was 95.6 % by CT, 90.9 % by double-dose intravenous IVP, and 78.8% by ultrasound (Qin and Wang 2002). Fig. 15.4.10. 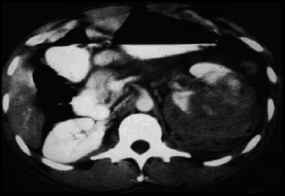 Horseshoe kidney with extensive injury to the right side as evidenced by an inhomogeneous nephrogram presence and location of the contralateral kidney (Steinberg 1984) (Fig. 15.4.9). Computed tomography is particularly useful in evaluating traumatic injuries to kidneys with preexisting abnormalities (Sebastia et al. 1999; Kawashima et al. 2001). The ratio of hematoma area to body area on CT is very useful in evaluating blunt injuries and the change of the hematoma size is a valuable indicator for management (Ichigi et al. 1999; Goldman and Sandler 2004) (Fig. 15.4.10). Intravenous contrast should be administered concurrently for renal evaluation. A lack of contrast enhancement of the injured kidney is a hallmark of renal pedicle injury. In cases where this typical finding is not demonstrated, central perihilar hematoma increases the possibility of renal pedicle injury. This sign should be considered even if the renal parenchyma is well-enhanced (Shima et al. 1997). 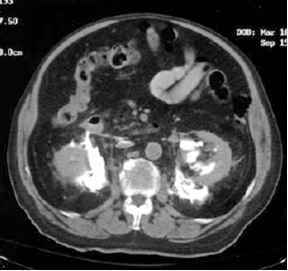 Renal vein injury remains an injury that is difficult to diagnose with any type of radiographic study; however, the presence on CT of a large hematoma, medial to the kidney and displacing the renal vasculature, should raise the suspicion of venous injury.